Frozen mangoes make excellent snacks and are great for a variety of recipes. Kids generally love mangoes and the frozen ones are so convenient! If you don’t like mangoes you most likely haven’t tried them enough. If you ever see frozen mangoes from the Philippines (Costco sometimes carries them), grab a bag and come home and make this ice cream. 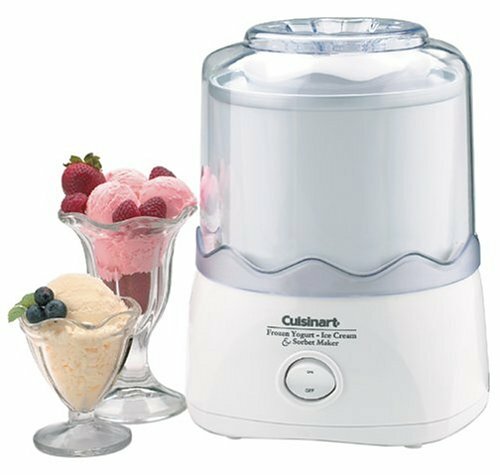 This recipe is to be used in a Cusinart ice cream maker. You need to freeze the Cusinart freezer bowl a day or more ahead of time. Make sure your freezer is cold enough to freeze the unit. You will know the canister is frozen if when you shake it you don’t hear water sloshing around inside. If you don’t have an ice cream maker, you can pour the mixture into ice cube trays and freeze until mostly frozen and then blend together in a high powered blender. But waiting a few hours for vanilla ice cream seems crazy to me when you can just add some frozen fruit (which we always have on hand) like mangoes and blend together in a high powered blender. I even like to only partially blend the fruit so you have fruit chunks. Sooooo yummy! The coconut milk is what makes this ice cream so creamy and delicious. If you know you like canned coconut milk then you can use that, but be aware that not everyone likes it canned. The taste of canned is very different from when it is freshly made or frozen. You don’t want to buy the “lite” less-fat version either. 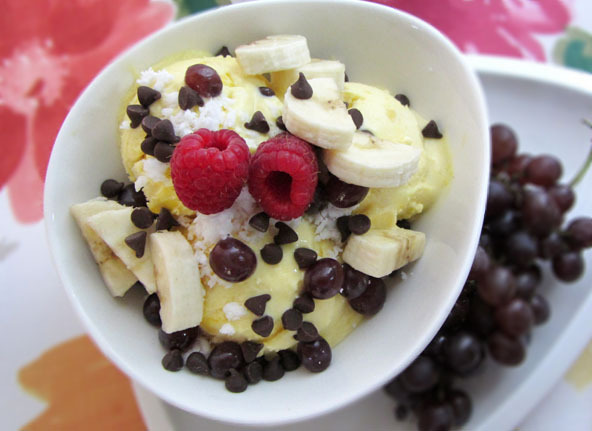 This recipe is to be used in a Cusinart ice cream maker. You need to freeze the Cusinart freezer bowl a day or more ahead of time. Make sure your freezer is cold enough to freeze the unit. You will know the canister is frozen if when you shake it you don't hear water sloshing around inside. If using a larger ice cream maker, double or triple recipe as needed. Please take Note The coconut milk is what makes this ice cream so creamy and delicious. If you know you like canned coconut milk then you can use that but be aware that not everyone likes it canned. The taste of canned is very different from when it is freshly made or frozen. You don't want to buy the "lite" version either. You can make your own fresh coconut milk. 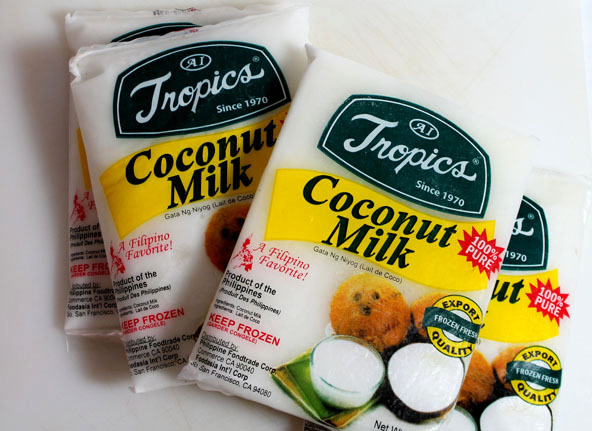 For convenience and price I buy frozen coconut milk in the freezer section at my local Asian Supermarket and I keep it on had for many other recipes. I'm telling you fresh or frozen coconut milk in this recipe really resembles the taste and texture of traditional western ice creams. Substituting any other milk in this recipe will not be nearly the same. Luckily enough, coconut milk is a healthy, acceptable choice for all six types of Wholetarians. Blend all ingredients together (except for the 1 cup of mango chunks) in the blender until well mixed. 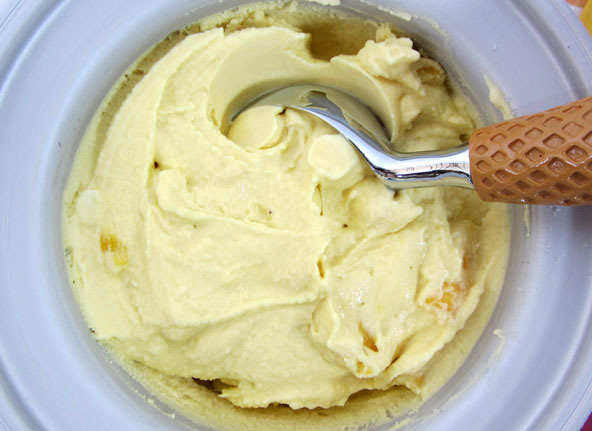 Cut the mangos into small chunks and add to the ice cream mixture as it is churning. Frozen fruit helps it freeze faster. Let it churn about 20 to 25 minutes until frozen. If it has a soft, texture, transfer the ice cream container to the freezer for about 1-2 hours. If it becomes too hard, remove from freezer and wait about 5 minutes before serving. You can substitute honey for the maple syrup but honey will keep it from freezing hard. My family prefers using maple syrup or ¼ cup maple syrup and ¼ cup honey. You can substitute almond milk or any nut milk for the coconut milk but fresh coconut milk is the creamiest. Once you add the mixture to the ice cream machine, you have to start it churning or the mixture will start freezing to the sides and keep the machine from working.